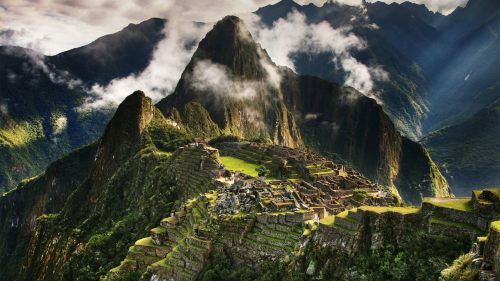 Aeromexico has dropped the price of their flights from Vancouver to Lima, Peru down to $498 CAD roundtrip including taxes. The flights have 1 stop in Mexico City each way. You can also fly into one South American city, and home from another, for similar prices. For example, fly from Vancouver to Quito, Ecuador and then home from Lima, Peru to Vancouver for $494 CAD roundtrip including taxes. The flight between the two South American cities is not included. 3. Now you need to decide which combination of cities and dates to try. You may want to start by trying dates from the lists above. Even better, you may want to start by picking a departure date from the list of *DEPARTURE* dates for the city you want to fly into. And picking a return date from the list of *RETURN* dates for the city you want to fly home from. 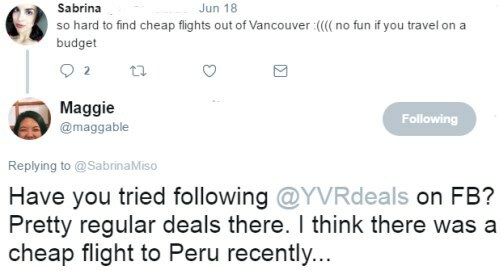 vancouver, yvr, flight deals, south america, lima, peru, lim, bogota, colombia, bog, aeromexico, medellin, mde, quito, ecuador and uio. 5 Responses to "Vancouver to Lima, Peru - $498 CAD roundtrip including taxes | new record! (Aug, Sep, Oct, Nov travel)"
I just booked YVR-LIM. Momondo took me to book via airtickets.com or tripsta.ca. Airtickets.com doesn't take AMEX, and tripsta.ca told me they would charge in EUR if I paid with AMEX, so I went to exploretrip.com. They're slightly higher at CAD502, but I found a promo code TRIP15, and it worked! So my AMEX was charged CAD487. I've bought from exploretrip.com a few times, I've got no issues with tickets they sold, although I've never gotten into any situations that I needed to call them. I've checked prices both Y and J, to Arequipa, Cuzco, etc round trips and open jaws, I didn't find anything crazy, so I booked a LIM round trip. These ones have disappeared for the time being, but Aeromexico has been putting them on sale every now and then. I'll definitely provide an update if and when they return! Hi Chris, have you seen any updates for flights to Lima? Do you think they will drop again? These have disappeared for now, but these ones have come and gone more than a few times from Vancouver and Calgary. I will definitely let everyone know if they come back.